Coaching sports requires many talents. Coach must be a teacher, a mentor, a disciplinarian, highly organized, competitive and motivating. A high school sports coach manages the many different aspects of a team. As the coach you’re expected to be a role model for your players. You must teach positive spirit and encourage sportsmanship. You’ll have to teach your players respect and how to keep your composure. The best way a coach can teach his players these things is by modeling them himself. There are many difficult aspects of being a high school sports coach, most of which don’t have anything to do with the game. Coaches must handle difficult parents and unruly fans. Coaches sometimes have to cut players from a team. This is probably the most difficult aspect of being a coach. Sometimes student-athletes have their heart set on being a member of a team and a coach must break it to them that they haven’t made it. Telling a student that they haven’t made the team requires tact and compassion. Occasionally, following a cut, coaches must deal with the parents of students who haven’t made the team. Coaches must also spend a large amount of time coaching. They must attend trainings, practices and games. Most high school coaches have another job, so coaching causes them to spend a large amount of time away from their families. On a more positive note, coaches can have a huge impact on the development of the student-athlete. Imparting the values of sportsmanship and teamwork can have a lasting impact on the character of the student-athlete. This is where coaching High School sports versus coaching athletes of other ages differs greatly. Student-athletes are still in the developmental stage and lessons learned are very important. Coaches also must manage a huge variety of factors that require a tremendous amount of organizational skills. There are statistics, schedules, rosters, injury protocols, academic ineligibility, just to name just a few aspects of coaching that require attention to detail. Then of course, there is the game. Coaches must learn the tendencies of the opposing player as well as the tendencies of their own players. They must select the players they believe to be the best at each position, they must set up an offense and a defense and make adjustments on the fly. A good coach will be very good at time management and learn the proper time to make key substitutions. They must deal with the officials in a respectful and calm manner, again, modeling for their athletes. Coaching at the high school level is an essentially thankless position. Coaches take all the blame when their team is losing and receive very little credit when their team is winning. 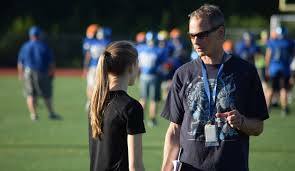 Parents and fans are generally unaware of the teaching moments that student-athletes experience with their coaches. To be a high school coach you must be willing to constantly give of yourself for very little reward. Except, of course, the reward of successfully mentoring young men or women.